Stocks continue to do nothing wrong as they bounce sharply from the epic selling wave in December. On Tuesday most of the major stock market indices made new recovery highs. Leadership has been constructive, meaning the more aggressive sectors have been leading. Risk on, if you will. However, stocks have also rallied right into the zone I first mentioned on December 21 as the most logical area where the bears could put up a fight. From here we will see if the bulls begin to waver. Some of you asked why I haven’t mentioned the NYSE Advance/Decline Line at all when I was so focused on it for most of 2018. It’s because I don’t find it all that helpful when stocks begin a rally. Almost every single time stocks lift after a significant decline, the NYSE A/D Line lifts as well as you can see below. The only help it would offer if in the rarest case, it did not rally with stocks. Now that would be a huge concern. 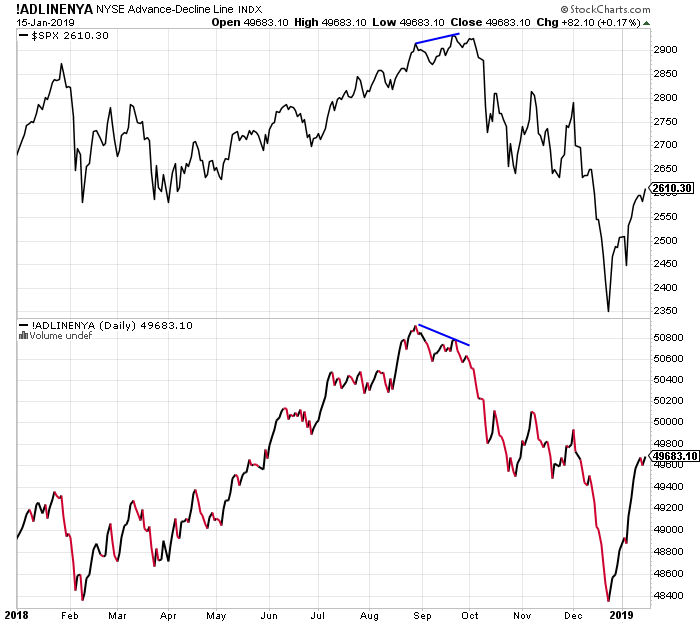 From here, I want to look for points where the NYSE A/D Line goes down as stocks are making new recovery highs. That’s a warning sign. Equilibrium or End of Rally? 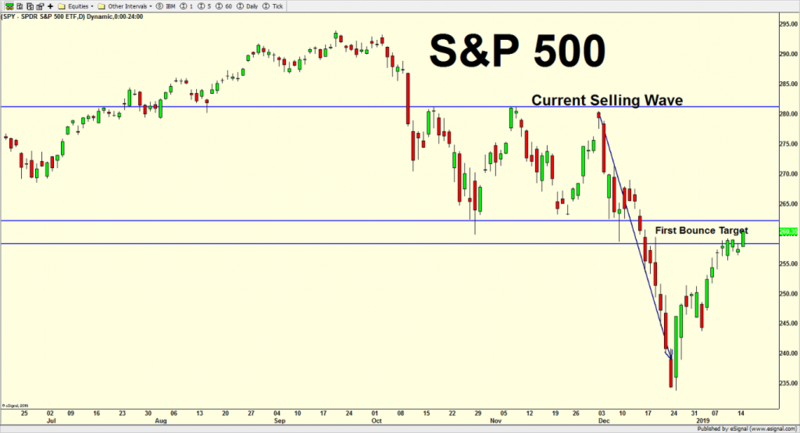 Almost on cue, stocks began to either stall out or moderate as they entered the lower end of the zone I first offered on December 21. That is a logical place for some to takes chips off the table if a revisiting of the Christmas lows is going to happen sooner than later. So far, stocks have done nothing wrong, especially with high yield bonds and bank loans snapping back so strongly in 2019, but I am not going to be complacent so easily. If bears continue to open stocks lower only to entice the bulls to step up in the afternoon and into the close, I will roll with it. However, if and when that tenor changes, I will likely become a bit more concerned. As I keep mentioning, “V” bottoms are very rare and more characteristic of a long-term bear market. So not only am I not counting on one right now, I also do not believe it will happen because I don’t see this as a 2000-2002 or 2007-2009 affair. Finally, our bear trend indicator for the NASDAQ 100 stopped flashing as of last week’s close. It’s not that big of deal because it moves from week to week. The Dow, S&P 500, Russell, Europe and emerging markets remain in place. It’s been one heckuva start to 2019. Just listen to the media and pundits tell you how stocks have rocketed 7, 10, even 12% since Christmas. While that is true, it’s a bit misleading as they forget the carnage from Q4. As I wrote about here and here late last year, there was certainly a preponderance of evidence to suggest a bottom and vicious bounce. That has come to fruition and I am glad the market is cooperating with the likely scenario. Stocks now begin to face the zone I first offered on December 21 as a logical point where the rally may start to stall out or even end as you can see below. The market has done nothing wrong so far, but it has come very far, very fast. In my 30 years, I have never been a big believer in “V” type bottoms where stocks fall hard into a low and then rally straight back up, essentially unabated. They are rare and don’t have a super track record. 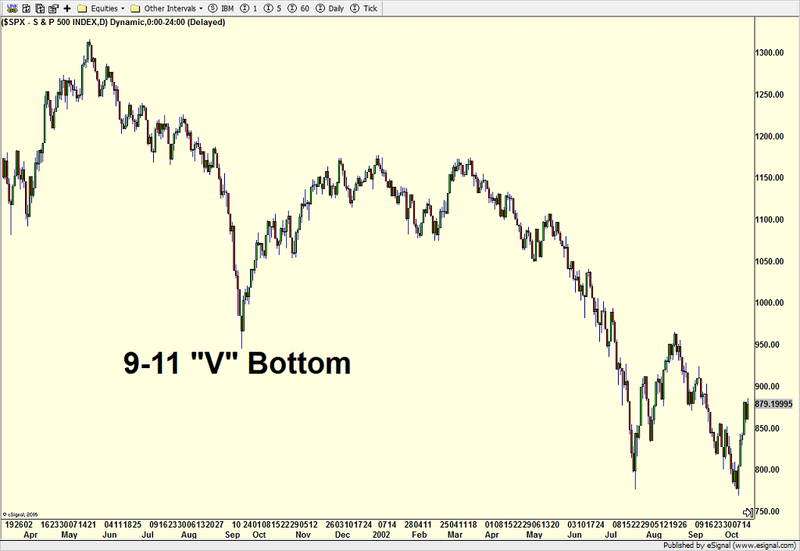 The low after 9-11 was a classic “V” and that ended up failing after a very strong rally as you can see below. Right now, I am keenly watching for signs that this very powerful rally off the bottom is stalling or ending. My concern remains that the stock market may want to head back down to the Christmas lows and say hello before a more meaningful and sustainable rally takes hold. It really is amazing how stocks go from never being able to rally to never being able to decline. 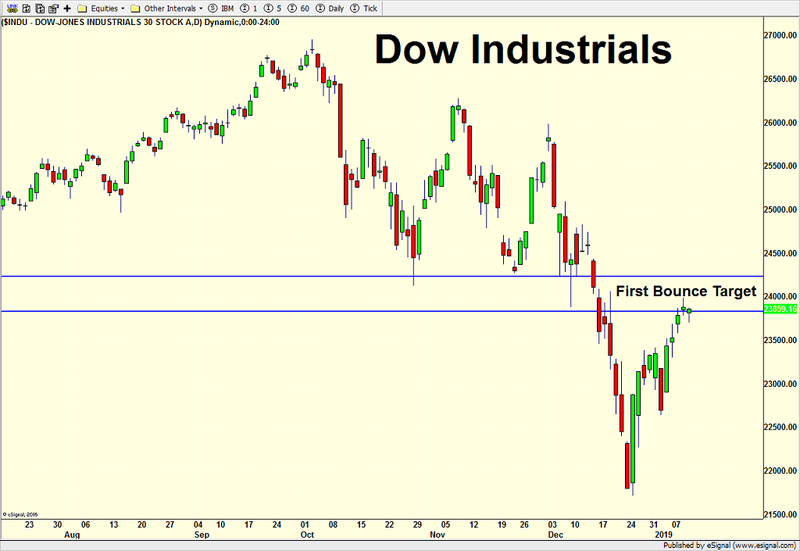 After the stock market hammered out the bottom on December 26, the reaction by bulls has been easy to predict. I only wish I did a better job leading up to that low in December. Live and learn which I always do. At this point, we have seen epic buying since December 26 with all kinds of very positive indicators triggering for the intermediate and long-term. Various breadth thrusts, which I will probably spell out in the next Street$marts, comparable post 20% declines without recession, high yield bonds, sentiment surveys and on and on. On Christmas, I posted this piece which showed only a handful of comparable environments to the selling we saw in December. While the short-term was not consistent, the intermediate-term certainly was and was a bonanza for the bulls. Although I do believe the internal or momentum low was seen on December 26, I do not believe stocks are off to the races, never to look back. That behavior would be more in line with 2001 and the bear market which I do not believe to be the case today. Below is an old chart that remains very much in play. You can see how much volatility spiked in December. The very first sign of the selling abating would be when the VIX index fell back into the Q4 trading range below the light blue line. It has already done that. I think the real all clear sign comes if and when the VIX closes below 16 for a few days which is depicted by the dark blue line. Stocks have bounced very hard, very fast. I think the easy money has been made in this very first rally off of the bottom. In fact, stocks are getting close to the point where paring back may be the best strategy. 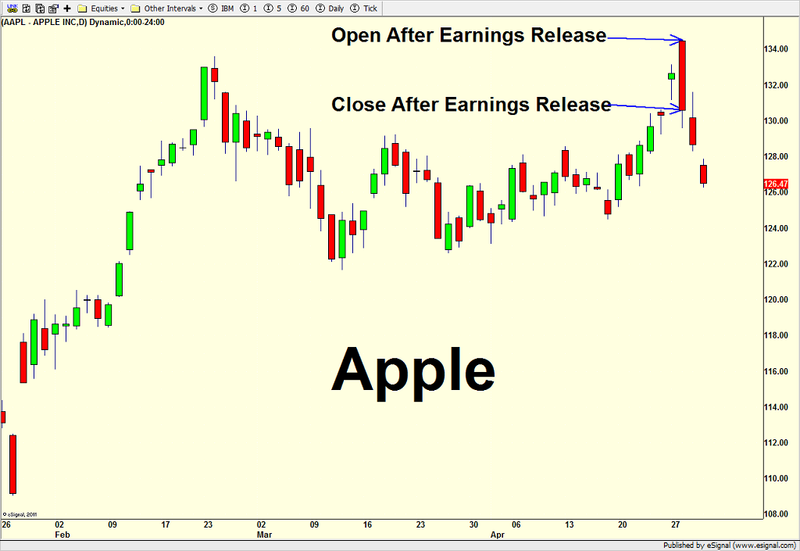 In my last blog post, Apple had pre-announced less than expected earnings news and stocks were looking sharply lower on Thursday morning. 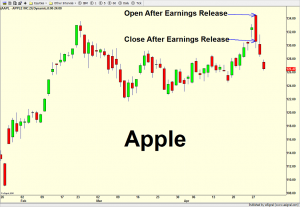 Besides commenting that it was probably a day to just sit back and watch, I also offered that historically, news like this from Apple usually comes near stock market lows.Thursday had an unusually dour feel to it. It seemed like the parade of pundits were all talking about an immediate retest of the Christmas week lows and that investors should be out buying bottled water and canned goods. My Twitter feed was full of Treasury bond bulls taking victory laps and calls for a much worse bear trend. VOILA! Thursday ended up being a sweet bear trap. There were three very good pieces of good news on Friday. First, overnight, the People’s Bank of China lowered reserve requirements which effectively puts more into the economy, a sort of stimulus. That got pre-market trading to indicate a much higher opening for the U.S. Then the December employment report was yet another blockbuster! 312,000 new jobs created. More people back in the workforce. Wages growth hit 3% again. These are just not recessionary numbers, at least not yet. Finally, and perhaps most importantly, Powell, Yellen and Bernanke all appeared on a panel at the Atlanta Economics Club where Powell reversed course very sharply from just a few weeks ago. It really is amazing what a 20% decline in stocks will do a hawkish Fed chair. Boy did stocks respond, for the second time in two weeks. While we didn’t have another 1000 point gain, stocks did soar more than 3% and again we saw 95% of the volume occur in stocks that were up. That is usually a very goo sign for the intermediate-term. With sentiment so negatively extreme, there is a good backdrop for the bulls over the next 3 to 6 months, even if that means a revisit to the Christmas week lows this quarter. I thought it was a very good sign that high yield (junk) bonds saw a lot of love and interest. That hasn’t happened in a long while. The past two weeks have been good steps, but there will be other tests, likely at higher prices for the bulls to pass. 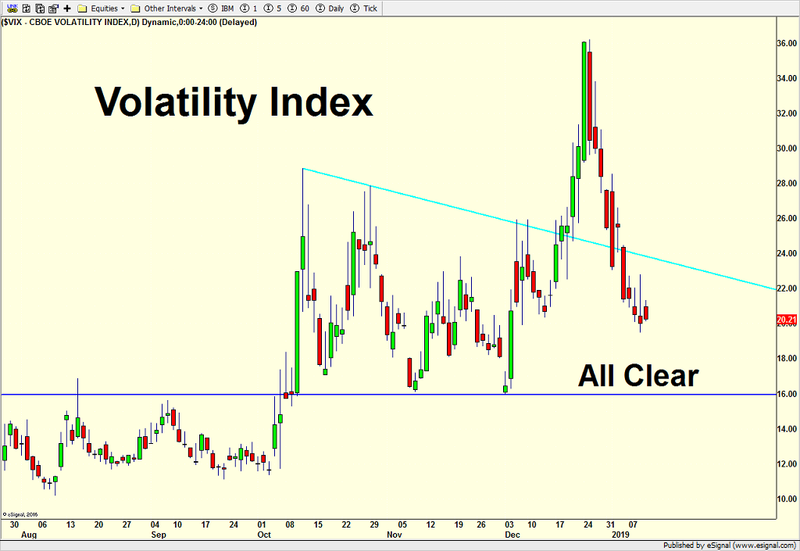 I want to see the VIX close under 16 and the number of stocks in uptrends climb back above 60%. After opening down 400 points on the first trading day of 2019, the bulls fought back really hard to erase 100% of that loss by the close and eke out a small gain. That was very impressive. Leadership came from the most beaten down sectors from 2018, energy and financials. That’s not surprising. So many investors sold those names during Q4 for tax loss reasons as well as window dressing to make their portfolio holdings look better than they actually were. January 2nd was definitely a risk on day as the defensive sectors were in the red all day. That kind of across the board reversal would ordinarily carry over for at least a day or three. However, Apple pre-announced sales that were much lower than expected after hours yesterday and it looks like a repeat on Wednesday’s open. I would be very, very surprised if stocks were able to shrug off this bad news and reverse for a second straight day although history does suggest that action like this in Apple that spills over into the rest of the market usually comes near some type of low. In short, I think Thursday is a watch and wait kind of day. Let’s see if market internals are stronger than price action. Let’s see how stocks trade after lunch and into the close.